The above news item was published 59 years ago in Adelaide newspaper The Mail, on Saturday 24 January 1953. It raises more questions than it answers. Why did Mr E.T. 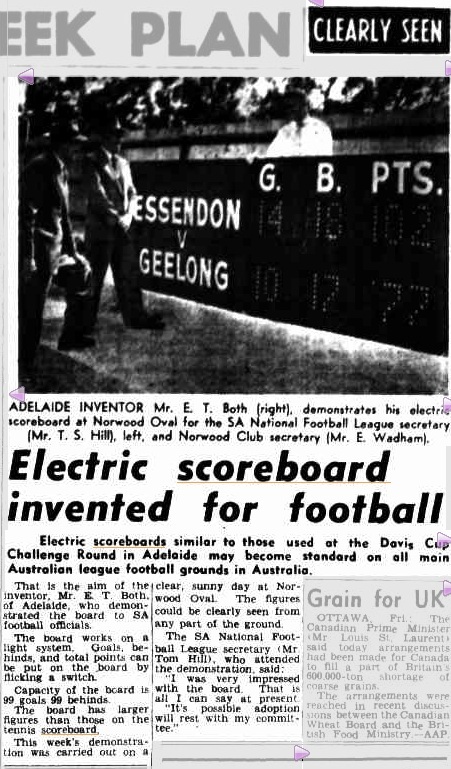 Both, the inventor of this electric scoreboard and an Adelaide resident, display the names of teams from the then Victorian Football League? Was Mr Both an Essendon fan? Why not, say, the names of Norwood and Sturt? Is there any significance to the scores? What became of the scoreboard? What became of Mr Both? Did the South Australian National Football League endorse Mr Both’s invention? The news item’s final quotes suggest that, nearly 60 years ago, football administrators were well versed in not saying very much at all. Scoreboard Pressure is hoping to hear back from the Norwood Football Club history group about the fate of Mr Both’s scoreboard. The news item was sourced from the National Library of Australia’s Trove site, a terrific resource. Love the scoreboard story, but my main thought after reading this was “bring back Steak Week”.